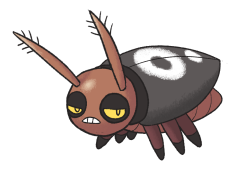 Kroach is a Bug/Dark Pokémon. It evolves into Enkroach at level 25. It infests homes in the middle of the night and steals food. A swarm of hungry Kroach can lead to the evacuation of entire neighborhoods. It loves darkness and filth. When a light source is shined in its direction, it will scurry away, but when it is cornered, it will hiss and bite. Kroach is based on a cockroach. Its general design, with the pattern 'sprayed' on its back, is supposed to evoke a 'grunge' or 'punk' aesthetic.